PAS leaders are now buying time before making a ‘do or die’ battle in the coming general election – meaning go alone or with the opposition pact. 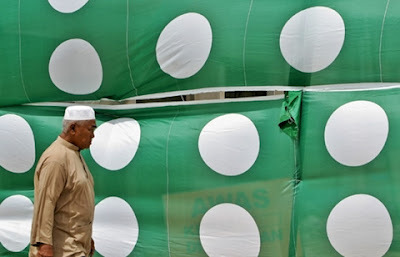 Threading carefully on a tightrope – not to antagonize partner DAP and PKR while trying hard to comfort the rising anger of party members – PAS president Abdul Hadi Awang was given no choice but to pacify members by putting up a stand. Simple as it might seem, the stand actually sent ‘shivers’ to other Pakatan leaders because PAS, despite being fundamentalists and orthodox in many ways, still attracts Muslims of all ages. Compare PAS with PKR, PAS has more support and real members who are loyal and obsessed while PKR is presently shaky with many ‘jump ships’ given the dwindling credibility of Anwar Ibrahim. While PAS members at grass root level are speaking out loud against the party leadership for ignoring or sidelining the Syura Council on the use of word ALLAH, PKR and Anwar do not even have any qualms in going along with DAP on the issue. In fact, Anwar’s statement in Sabah where he ran down PAS spiritual leader Nik Aziz Nik Mat and Abdul Hadi had affect the already sour relationship between the two parties and this does not augurs well for their ‘political relationship’. DAP Karpal Singh had come out with statement to ‘cool down the rising temperature’ by saying all parties in the opposition pact were working well and agreed on most major matters except few small matters. That was Karpal’s statement, a PR piece for public consumption when he himself knows that the opposition pact is like a boat being struck by huge waves and at the verge of collapsing. The political relationship is very volatile at present and with the general election nearing, Karpal tries hard to make the political relationship work stronger but the circumstances right now are inevitable. Issues involved are not superficial but they touched on fundamentals especially with PAS as they involved the party’s ideology on Islam, the most important element the party claimed has been struggling for. Abdul Hadi has no choice as the pressure from party members may have tremendous backlash on the party, so he stressed that PAS would have no qualms to break off from the opposition pact if the partners did not respect PAS’ ideology. This simply means PAS may just break off because the party members and supporters are getting restless with Anwar’s statement that did not reflect any respect for PAS or the party leaders. Worse when he and Karpal still insist on Abdul Hadi to get the Syura Council to ‘toe the line’ of Pakatan’s so called ‘wisdom just to win the votes’, regardless of whether the means to the end are right or wrong or haram or halal. Given such scenario, it is best that PAS leaders take the decision to split from the pact than being ridiculed, shamed and under pressure from loyal members and supporters.